The FuG 25 is an "IFF" or "Identification Friend or Foe" unit. It is essentially a radar transponder. The radar (Typically a Freya early warning or Wuerzburg tracking radar) would send out a pulse. This signal is picked up by the FuG 25 and returns a signal to the radar at a different frequency. This signal is coded (with a morse code), so that the radar operator can determine if the echo he is looking at is a friendly or enemy aircraft. The early version Fug 25 "Zwilling" received only on 560 Mhz, the early operating frequency of the Wuerzburg radar. It was nicknamed "Zwilling" or "twin", because it still consisted of two units mounted on the single frame. An improved version, the FuG25a "Erstling" or "firstborn" received on a frequency between 117 and 133 Mhz which was the operating frequency range of the "Freya" radars. The "Erstling" was now a single unit that still fitted on the same mounting frame. Wuerzburg radars were equipped with a special supplementary "Kuh" transmitter to activate the FuG 25a. Because of the increased use of "window" or "chaff" by the allies, the Germans had to make their radar systems more flexible, operating over a wider range of frequencies. For this reason the FuG 25a receiver gets "wobbled"; a small motor constantly detunes the receiver between 117 and 133 Mhz. When a certain impulse frequency at in receiving range was received, the FuG 25 was triggered and started sending a signal back on 156 Mhz. The signal was morse coded with a code letter, this code letter would be changed regularly to avoid duplication by the enemy. The pilot had a choice of two code letter, pre-programmed in special keys stuck into the FuG 25a coding mechanism. Note the "1" and "2" numbers painted on the cover, denoting which key is which. The keys have a number of notches that can be broken off. The pattern of missing and remaining notches on the key determines the code letter transmitted. The keys were supplied with all notches intact, to prepare a new key, an aircraft mechanic would simply break off the notches to create the code of the day and slot them into the FuG25 unit prior to the mission. The test button is inactive. A small test transmitter was originally part of the FuG 25a design, but was never implemented in the manufacture. I guess it was not a good idea to activate the FuG 25a when not required as it could a) confuse the radar operators who might pick the signal up and b) give the enemy a warning that something was up. On early schematics the test transmitter can still be found, but on later schematics it is simply left out as well. The signal light would light up if the FuG 25a was activated so that the pilot could see if he was being picked up by friendly radar. 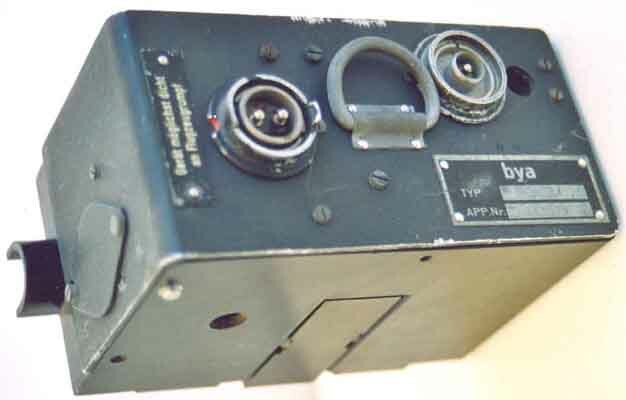 A later version of the BG 25, the BG 25a additionally had a "0" position between the "1" and "2", so that the pilot could keep transponder on standby (rather than switching it off completely with the power supply switch). After the equipment is switch on, the PV 62 switch is moved to the "1" position, this shows the supply voltage. The red indicator frame is adjusted so that it is centered around the supply voltage indication. When the other positions are selected, the voltages shown should be inside the red "window". A pretty quick and handy way of testing the voltages. The receiver for the signals transmitted by the FuG 25a in the radar was called the "Gemse" (goat). Later in the war, the "Erstling"/ "Gemse" system was used for fighter control purposes in the so called "EGON Verfahren" (Erstling/Gemse Offensiv Navigationverfahren). Finally, a description of how this system works in English. Rare, complete and with the intention of becoming operational!!! Like the "Erstling", the receiver is wobbled, in this case between 157 and 187 Mhz. When a signal is received, the transponder transmit a number of pulses. There are no changeable keys to modify the code. Instead the coding was achieved by a relay switches operated by notched wheels; these could be set for a narrow pulse, a wide pulse or no pulse. Six different sequences of four of these pulses could be generated with relay circuitry. The top section contains the actual receiver (on the left) and transmitter (on the right). The transmitter unit could easily be exchanged to change transmission frequency. An interesting feature of the transmitter is that the signal is picked up capacitively from the tube by the moveable plate; in this way the output power could be varied by the slider front right of the unit. Like the "Erstling", there was an explosive charge placed in the unit to prevent it falling into enemy hands. The big "D" warning seen on the first picture stands for Detonator. The USAAF employed a similar version called the SCR-695. P.S. if anybody can help me find the antenna for the R3121 please let me know. The keys have a number of notches that can be broken off. The pattern of missing and remaining notches on the key determines the code letter transmitted. Thanks! Do you have an information, how exactly the code was generated by the notches? Was the missing part the morse "." and remaining part the morse "-" or was the some other coding scheme? A full key with all the notches in place will produce no signal, a key with all notches removed will produced a "full" signal. The full signal being a tone of 1,25 seconds and a break of 0.25 seconds. The sequence starts from the handle of the key. There are ten notches; for example to make an "R" (. - . ), starting from the handle of the key, you break off notch 1, 3 ,4 ,5 and 7 (or 2, 4, 5, 6, and 8). This assumes a "pure" morse code, where the dash is three times as long as the dot (as per the FuG 25 manual). Obviously this limits the number of "pure" letters that can be made as there are not enough notches to make a "J" or "Q" for example. A, B, D, E, F, G, H, I, K, L, M, N, R, S, T, U, V, W plus the number "5"
As usual the most difficult bit is to find all the correct cable glands and the flat cable between the AR25 frame and the VD25 connection box, but once I sourced these I could finally get things completed. Please have some informations for other german IFF ? Very interesting and nice display! Did the FuG 25a have the ability to operate in an air to air mode and interrogate other aircraft or did it simply respond to interrogation from a ground radar? The FuG25 was purely triggered by Freya or Wuerzburg (and later Mannheim) ground based radar using a Kuh/Gemse transmitter and receiver. The German airborne radar systems had no provision for triggering the FuG 25. I was very pleased to find this forum as the topic of IFF during WW2 & most particularly the FuG25a have intrigued me for years. I recently picked up Erstling in pristine condition (less case, tubes & accessories) & am grateful to have this forum to help in my future restoration efforts. Welcome to the forum and the wonderful world of Luftwaffe radio collecting! You will find a lot of information on the FuG25 in this thread and the various links mentioned. Thanks! Would you be familiar with Remco? He lives in Normandy & has a large collection of WW2 electronics.